From the files: A lane splitter on I-5 heading north into LA in October 2014. 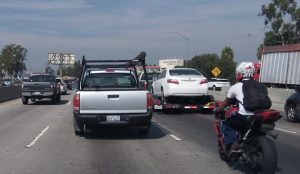 Lane splitting is legal in California, as the late Jim Clausen informed me when I marveled at the nerve of the guy in this shot, which I took on the Santa Ana Freeway and then published in October 2014. Some motorcyclists and state lawmakers now want to make the practice legal in Oregon as well. The other day I had a chat with Rich Burright, a dedicated motorcyclist. He’s a member of Hub City Abate, a mid-valley group promoting training, responsible motorcycle riding, and traffic safety in general. He told me about Senate Bill 385, introduced ahead of the legislative session that starts in Salem this week. This is a bipartisan bill. Introduced at the request of Democrat Val Hoyle, a former legislator from Eugene, the bill counts among its cosponsors Sens. Sara Gelser, D-Corvallis, and Kim Thatcher, R-Keizer, as well as Rep. Sherrie Sprenger, R-Scio. Shooting for the gap: He made it. On multi-lane highways, the bill would allow the operators of motorcycles and mopeds to drive between adjacent lanes of vehicles (as long as they’re all going in the same direction). Restrictions would apply. however. First, only two-wheelers would be allowed to split lanes. For obvious reasons, those three-wheel contraptions you see sometimes would not be covered. Nor would motorcycles with sidecars. Also, lane splitting would be legal only on highways with posted speed limits of 50 mph or greater, and only if traffic has slowed to 10 mph or stopped altogether, and only if motorcycles go no faster than 20 miles an hour. The American Motorcyclist Association, in a 2016 statement on lane splitting, said the practice is not illegal in only one state, California. Legislation to allow it was offered in other states but so far nothing had passed. The association points to a study done at the University California at Berkeley, which found that when lane splitting is allowed, motorcyclists are slightly less likely to be hurt or killed in traffic. This makes sense because if they’re between lanes in stop-and-go traffic, motorcycles are less likely to become involved in a rear-end crash. That alone is a reason to pass the bill. Burright told me that legalizing lane splitting would have another benefit: Drivers of air-cooled machines would have to worry less about overheating when they don’t have to creep along with very slow traffic or come to frequent stops. I have spent time in santa ana. I think the lanes are wider there. I thought it was extremely dangerous there, I know we all reject change, like bikers did with helmets and we did with seat belts. If the Bikers want it, im ok with it. But in the event of a last minute lane change I think the lane splitter may get the short end of the stick. Legalize lane-splitting? Yes, but only if those driving cars, etcetera, are indemnified when, inevitably, a lane-splitting biker is run over by a car which did not see the bike. Bikers who are so impatient as to risk their life by lane splitting do not deserve any special driving privilege. Saving a couple of minutes on one’s commute does not justify putting the rest of us in a position of increased liability. The reason there are lanes is so that traffic control can work. By definition, when a vehicle is allowed to split the lane, that vehicle instantly changes the intent of the roadway concept, putting operators of cars and trucks in a legal limbo. Indemnify all vehicles against this practice and place ALL liability on lane-splitting bikers can and then this operator won’t care if bikers ride the ditches… if that makes them feel good. If the state will not indemnify all others against this dangerous practice then keep bikers in their lanes. “only if traffic has slowed to 10 mph or stopped altogether, and only if motorcycles go no faster than 20 miles an hour.” Did you read the story? You’re not likely to be changing lanes in these conditions. If these are not the conditions then the motorcyclist is not following the law, therefore you are not liable. Problem solved. I’m all for it. The goal is to keep traffic moving, every little bit helps. This prevents rear-end accidents? Nonsense. What prevents accidents is everyone maintaining the required safe distance between vehicles, as already required by law. One “study” can be found to prove anything. How allowing a few impatient motorcyclists to evade the law and risk being killed by a lane-changing automobile or other vehicle is a concept beyond me. This is just a way to further reward the “me-first” population at the risk of everyone else. It’s a bad idea. How would they be “evading the law” if it was made legal? Tony said “What prevents accidents is everyone maintaining the required safe distance between vehicles”. I agree with this statement. However We are definitely in the minority it appears. The majority of drivers, from my observation both in the city and on the highway, do *not* maintain a safe stopping distance. Furthermore, I have yet to see or hear of someone ticketed for such, although I presume that it must occasionally happen. I was taught the 3 second rule when I learned to drive, and still follow it. I know what it looks like on the freeway, and it seems to me that most drivers do not, except on very light travel days. If I leave a 3 second gap on a moderate travel day, that space is frequently squeezed into by other drivers. But this is all beside the point of lane splitting. Regarding changing lanes in traffic jams, yes people do change lanes in jams. It is still necessary to move right towards your exit, or to the left if there are miles to travel. While not a bike rider today, I do not begrudge those who do from lane splitting, but would prefer that their speed be capped at perhaps 15 mph over the speed of the automobiles. Would also like to see this enforced, but have little hope of that happening.